Not to be confused with Elephanta Island, Elephant Jason Island, Elephant Island, or Elephant Island (Vanuatu). Elephantine (/ˌɛlɪfænˈtaɪniː, -ˈtiː-/ EL-i-fan-TY-nee, -⁠TEE-; Ancient Egyptian: ꜣbw; Egyptian Arabic: جزيرة الفنتين‎, translit. Gazīrat il-Fantīn; Greek: Ἐλεφαντίνη; Coptic: (Yebo/Ebou/Ibow) is an island on the Nile, forming part of the city of Aswan in Upper Egypt. There are archaeological sites on the island. Elephantine is 1,200 metres (3,900 ft) from north to south, and is 400 metres (1,300 ft) across at its widest point. 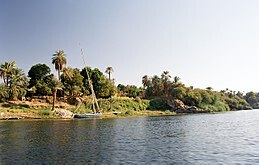 The layout of this and other nearby islands in Aswan can be seen from west bank hillsides along the Nile. The island is located just downstream of the First Cataract, at the southern border of Upper Egypt with Lower Nubia. 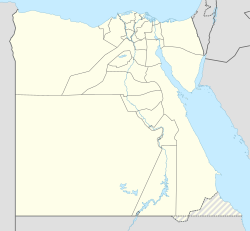 This region above is referred to as Upper Egypt because it is further up the Nile. Known to the Ancient Egyptians as Ibw "Elephant" (Middle Egyptian: /ˈʀuːbaw/ → Medio-Late Egyptian: /ˈjuːbəʔ/ → Coptic: (Ⲉ)ⲓⲏⲃ /ˈjeβ/), the island of Elephantine stood at the border between Egypt and Nubia. It was an excellent defensive site for a city and its location made it a natural cargo transfer point for river trade. This border is near the Tropic of Cancer, the most northerly latitude at which the sun can appear directly overhead at noon and from which it appears to reverse direction or "turn back" at the solstices. Elephantine was a fort that stood just before the first cataract of the Nile. During the Second Intermediate Period (1650–1550 BC), the fort marked the southern border of Egypt. According to ancient Egyptian religion, Elephantine was the dwelling place of Khnum, the ram-headed god of the cataracts, who guarded and controlled the waters of the Nile from caves beneath the island. He was worshipped here as part of a late triad of Egyptian deities. This "Elephantine Triad" included Satis and Anuket. Satis was worshipped from very early times as a war goddess and protector of this strategic region of Egypt. When seen as a fertility goddess, she personified the bountiful annual flooding of the Nile, which was identified as her daughter, Anuket. The cult of Satis originated in the ancient city of Aswan. Later, when the triad was formed, Khnum became identified as her consort and, thereby, was thought of as the father of Anuket. His role in myths changed later and another deity was assigned his duties with the river. At that time his role as a potter enabled him to be assigned a duty in the creation of human bodies. Ongoing excavations by the German Archaeological Institute at the town have uncovered many findings, on display in the Aswan Museum located on the island, including a mummified ram of Khnum. Artifacts dating back to prehistoric Egypt have been found on Elephantine. A rare calendar, known as the Elephantine Calendar of Things, which dates to the reign of Thutmose III during the Eighteenth Dynasty, was found in fragments on the island. In ancient times the island was also an important stone quarry, providing granite for monuments and buildings all over Egypt. The first temple was the Temple of Satet, it was founded around 3000 BC and enlarged and renovated over the next 3,000 years. There are records of an Egyptian temple to Khnum on the island as early as the Third Dynasty. This temple was completely rebuilt in the Late Period, during the Thirtieth Dynasty of Egypt, just before the foreign rule that followed in the Graeco-Roman Period. The Greeks formed the Ptolemaic dynasty during their three-hundred-year rule over Egypt (305–30 BC) and maintained the ancient religious customs and traditions, while often associating the Egyptian deities with their own. Most of the present day southern tip of the island is taken up by the ruins of the Temple of Khnum. These, the oldest ruins still standing on the island, are composed of a granite step pyramid from the Third Dynasty and a small temple built for the local Sixth Dynasty nomarch, Heqaib. In the Middle Kingdom, many officials, such as the local governors Sarenput I or Heqaib III, dedicated statues and shrines into the temple. There were forty-two such nomarch provinces created as regional governments that dated from the Old Kingdom through the Roman Period. The Aswan Museum, and a nilometer (lower left). A nilometer was a structure for measuring the Nile River's clarity and the water level during the annual flood season. There are two nilometers at Elephantine Island. The more famous is a corridor nilometer associated with the Temple of Satis, with a stone staircase that descends the corridor. It is one of the oldest nilometers in Egypt, last reconstructed in Roman times and still in use as late as the nineteenth century AD. Ninety steps that lead down to the river are marked with Arabic, Roman, and hieroglyphic numerals. Visible at the water's edge are inscriptions carved deeply into the rock during the Seventeenth Dynasty. The Elephantine papyri are caches of legal documents and letters written in Aramaic, which document a Jewish community, perhaps made up of mercenaries, dating to sometime in the 5th century BC. They maintained their own temple (also see House of Yahweh), in which sacrifices were offered, evincing polytheistic beliefs, which functioned alongside that of Khnum. The temple may have been built in reaction to Manasseh's reinstitution of pagan worship or simply to serve the needs of the Jewish community. The Aswan Museum is located at the southern end of the island. Ongoing excavations by the German Archaeological Institute at the island's ancient town site have uncovered many findings that are now on display in the museum, including a mummified ram of Khnum. A sizable population of Nubians live in three villages in the island's middle section. A large luxury hotel is at the island's northern end. The Aswan Botanical Garden is adjacent to the west on el Nabatat Island. ^ Merriam-Webster's Geographical Dictionary, Third Edition (Merriam-Webster, 1997; ISBN 0877795460), p. 351. ^ Meyboom, P. G. P. (1995). The Nile Mosaic of Palestrina: Early Evidence of Egyptian Religion in Italy. BRILL. p. 52. ISBN 90-04-10137-3. ^ a b Botta, Alejandro (2009). The Aramaic and Egyptian Legal Traditions at Elephantine: An Egyptological Approach. T&T Clark. pp. 15–116. ISBN 978-0567045331. ^ Grabbe, Lester L. (2011). A History of the Jews and Judaism in the Second Temple Period (vol. 2). Bloomsbury T&T Clark. p. 103. ISBN 978-0567541192. Wikimedia Commons has media related to Elephantine.